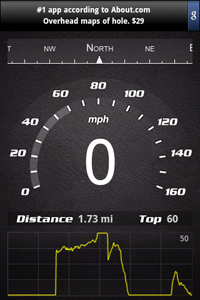 We would like to introduce our new app – SpeedView for Google Android. It’s an advanced GPS speedometer that uses the phone’s built-in GPS system to show yourÂ current and top speed, direction and distance traveled. Successfully tested using T-Mobile G1, Samsung Galaxy, Motorola Droid and Nexus One, it’s suitable for running, car driving, biking or hiking. The free, ad-supported version of SpeedView is available now for download on Android Market.Â Paid version with some additional features is coming soon.